Future reduction of sea ice in the Arctic could result in a loss of two-thirds of the world's polar bear population within 50 years, according to a series of studies released by the U.S. Geological Survey, USGS. This conclusion and the facts behind it will inform the U.S. government's upcoming decision whether or not to list the polar bear as a threatened species under the Endangered Species Act. During a six-month period of intensive analysis of both existing and new data, scientists from the USGS, other American and Canadian government agencies, universities and the private sector documented the direct relationship between the presence of Arctic sea ice and the survival and health of polar bears. 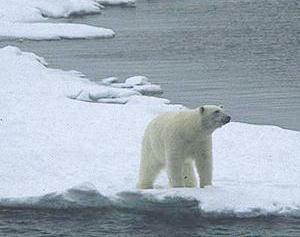 Polar bears depend on sea ice as a platform to hunt seals, their primary food. But sea ice is decreasing throughout their Arctic range due to climate change, scientific studies have documented. Declines in polar bear habitat have been recorded throughout the Polar Basin over the past 20 years of observations. The studies predict that almost two-thirds of the world's 19 polar bear populations will be extinct by mid-century and that three more populations of polar bears will probably be extinct within 75 years. "We now have official confirmation that the largest living land predator is going to go extinct in our lifetime," said Dr. Neil Hamilton, director of the WWF Arctic Programme from his headquarters in Norway.